For some, the need for collaboration in music production becoming ever greater and the Soundslates platform could well be just the perfect solution for producers and artists who want to create music together from all over the world. The first plugin to be brought to the Soundslates collaboration platform is the Moody Sampler and it gives you access to over 4000 cloud-based samples, plus the ability to share projects, settings and preset files, allowing you to obtain your sounds anywhere. The plugin is easy to use and features; multiple file-type importing, audio file slicing options, ADSR envelope, LFOs with flexible routing options, an analogue-modelled HP and LP filter and an FX container with built-in EQ, delay, reverb, compressor, saturator and flange effects. Moody Sampler is free to download and also includes a 200 sounds download-limit and 2GB cloud storage, available in the free Starter Plan. To gain access to an unlimited number of downloads, 100GB of personal storage and more, a premium subscription to the Producer Plan is required. 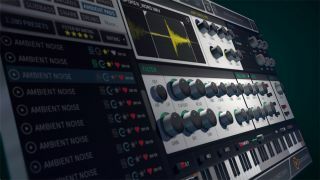 Access to the cloud-based sound library is made through the Soundslates' Musical Production Assistant, which includes the Moody Sampler plugin. The Soundslates MPA also allows you to backup your projects and collaborate with other Soundslates users at the same time. The sampler is the first component in a suite of cloud-based audio plugins created by Soundslates, with a cloud-based drum sequencer and effects plugins soon to be added. In the meantime, you can download the Soundslates MPA and Moody Sampler from the Soundslates website. To get your hands on all of this download Moody Sampler now, or visit the Soundslates website for more information.